Wedding favors are an important part of your event because they show your guests appreciation for sharing in your day. With most brides on a tight budget, favors are often overlooked ... but we've got a solution! Here are five of our favorite wedding favors, all under $3 each. Fill these Damask Design Mint Tins with the treat of your choice including candy, confetti and more, for a favor that really packs a punch! And the delicate damask design is nothing short of a classic. 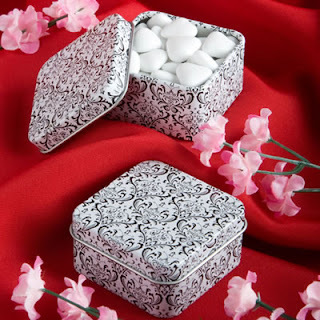 Each silver metal mint tin measures 2” square x 1” tall with a coated white and black damask design, with a removable lid. 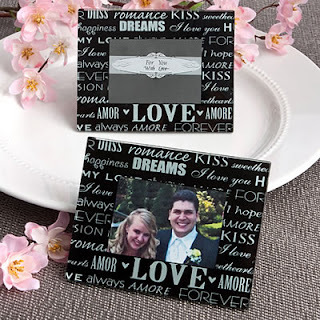 Refreshingly appropriate as black and white favors, and stylish mementos for all occasions. These tins are so affordable at only $1.50 per tin!! Please note that contents shown are not included. Weddings always bring tears of joy. 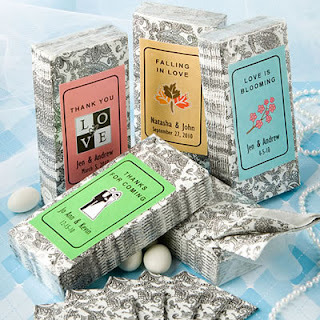 Why not offer your guests Personalized Tissue Weddings Favors? At $1.25 each, these are a bargain! Talk about a favor that’s sure to be useful and memorable. These travel tissue packs are destined find a place in your guests’ purses, suitcases, cars and more. And, they’re customized for your event to be truly one-of-a-kind! Each pack measures 4 1/8” x 2” x ¾” and contains 10 folded white tissues that open up to an 8 1/8” square in an elegant black paisley/damask design. The front of each pack is perfectly fit for the application of the personalized label of your choice. Available in an exceptional selection of colors, themes and customized titles for any special occasion, the labels are included in self sticking sheets for you to easily apply. There's a minimum order of 60, but most brides have more than 60 guests at their wedding. What words come to mind when you think of love? We came up with quite a few charming terms of endearment. And, we used them to make this Words of Love Frame a love-inspired work of art! From romance, to kisses to forever and beyond, these words will make sure that your guests know that love is definitely in the air. Each frame is made of glass with a black background decorated in words of love and measure 3.375 x 4.25". The opening will hold a 2.75" x 2" photo or place card and the cost is on $2.75 each. Here’s a favor that’s truly fit for a king – and queen. That’s because these Fleur di Lis Letter Opener showcase the treasured Fleur di Lis - symbolizing greatness, royalty and tradition. Each letter opener favor measures 5 ½” x 1 ¼” and has a silver metal blade base with a silver poly resin Fleur di Lis charm on top, enhanced with multiple shimmering rhinestones that accentuate the beautiful carved detail. 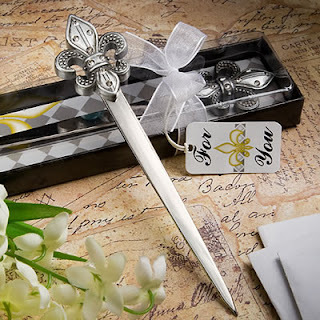 Great as French themed favors or for any occasion, each Fleur di Lis letter opener comes in a clear topped box with a black base and royal checkerboard design inside, tied with a white organza bow and attached matching “For You” tag. Treat all your guests to a delightful favor at only $2.95 each. 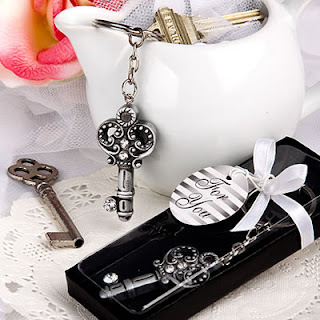 Unlock the fun and give you guests a classic memory maker with these Antique Key Design Key Chain Favor Usability and outstanding design are the key elements in a great favor. So, we took those key elements and put them into this classic key design key chain to create one great favor! It's guaranteed to be useful and its intricate antique key shape with modern rhinestone accents makes it an instant favor classic! Each key measures 1 7/8" x 7/8" (3" x 1" with chain) and is made of durable poly resin in an antique silver finish. The charm is attached to a sturdy silver metal chain and ring. Comes packaged in a clear topped box with a black textured base. Wrapped and tied with a white satin ribbon and finished with an attached round silver striped "for you" tag. Priced at $2.95 each. ﻿At WhereBridesGo.com, we are ALL about practical and affordable wedding favors. That's why we offer brides 10% OFF any size order with coupon code VIPBRIDE. Plus we offer FREE shipping on all orders over $100. With hundreds of cool and unique wedding favors to choose from, we guarantee there's something PERFECT for your wedding guests in our wedding favor department!